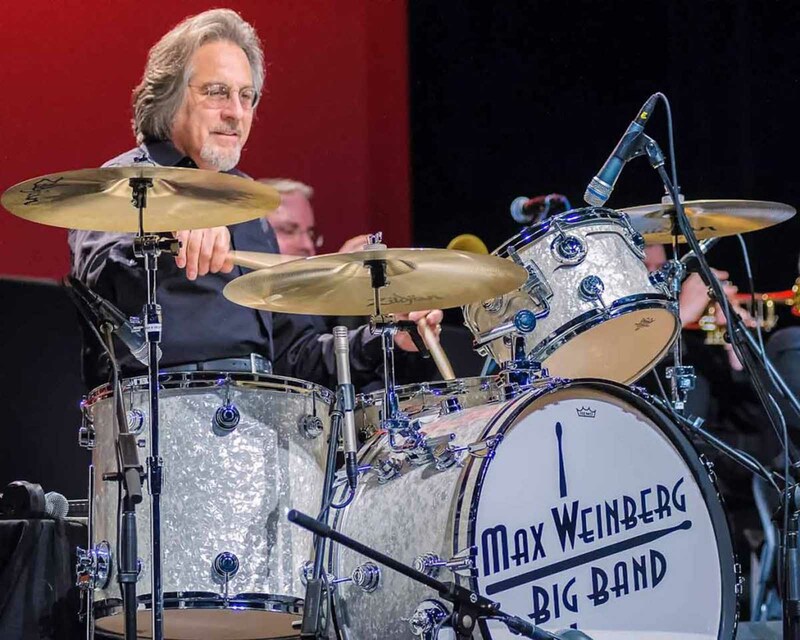 Max Weinberg is known as the longtime drummer for Bruce Springsteen’s E Street Band and as the bandleader for Conan O’Brien on Late Night with Conan O’Brien and The Tonight Show with Conan O’Brien. Weinberg grew up in suburban New Jersey and began drumming at an early age. He attended college planning to be a lawyer but got his big break in music in 1974 when he won an audition to become the drummer for Springsteen. Weinberg became a mainstay of Springsteen’s long concert performances. Springsteen dissolved the band in 1989, and Weinberg spent several years considering a law career and trying the business end of the music industry before deciding he wanted to continue with drumming. In 1993, Weinberg got the role as bandleader of The Max Weinberg 7 for Late Night with Conan O’Brien. Weinberg’s drums-driven jump blues sound and his role as a comic foil prospered along with the show, giving him a second career. In 1999, Springsteen re-formed the E Street Band for a series of tours and albums; Weinberg worked out an arrangement that allowed him to play with both O’Brien and Springsteen. In 2009, Weinberg moved to the short-lived Tonight Show with Conan O’Brien as leader of Max Weinberg and The Tonight Show Band. After that ended, he began touring with his own ensembles, and in 2010 chose not to follow O’Brien to the new Conan show. Weinberg continued playing with Springsteen, and in 2014 was inducted into the Rock and Roll Hall of Fame as a member of the E Street Band. “Max “the Mighty Max” Weinberg. A bundle of drive, neurosis, and wily suburban street smarts, and source of great humor, Max found a place where Bernard Purdie, Buddy Rich and Keith Moon intersected and made it his own. The soul of dedication and commitment, each night in the midst of the continuous hurricane our sets are designed to be, the sheer physical pressure of three hours of nonstop, steamrolling rock music lies upon his shoulders more heavily than anyone else’s. Onstage, Max goes beyond listening to what I’m saying, signaling; he “hears” what I’m thinking, feeling. He anticipates my thoughts as they come rolling full bore toward the drum riser. It’s a near telepathy that comes from years of playing and living together. It’s a real-world miracle and it’s why people love musicians. They show us how deeply we can experience one another’s minds and hearts, and how perfectly we can work in congress. With Max at my back, the questions are answered before they’re asked.